Sandie Bouton spent her childhood surrounded by animals and creatures, both real and fantastical, and was continually told that she was “o with the fairies” and had an overactive imagination. Sandie continued her love of animals and mystical creatures, especially the unicorn, into her adult life. 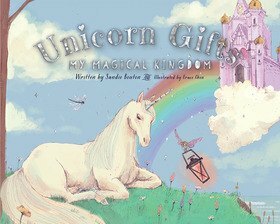 It was then that the rst book in the ‘My Magical Kingdom’ series was conceived in the form of Unicorn Gifts. Sandie works in children’s mental health and has used her love of igniting a child’s imagination to facilitate counselling and guided meditation for children. Sandie continues to happily nourish and embrace her inner child.